Photos by Tom Rivers: Town Supervisor Robert Miller says Murray officials are trying to encourage more farms to hold special events that can strengthen the operations and draw visitors to the community. 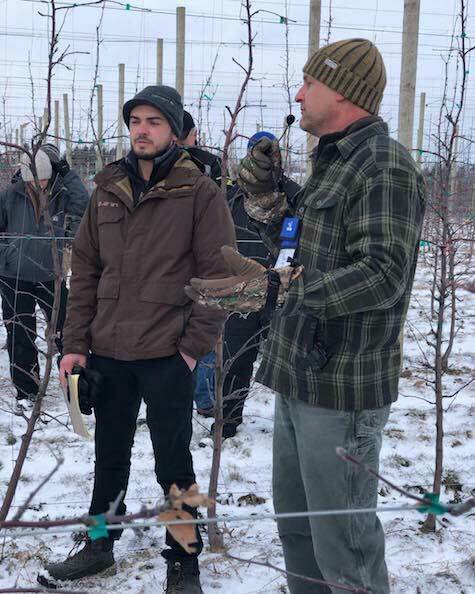 MURRAY – The Town Board didn’t pass a new law regulating special events at farms and wineries on Tuesday, after several residents shared their concerns that the legislation could hurt the operations by imposing new restrictions. The town will have the Planning Board and attorney Jeff Martin take another look at the law and try to address residents’ concerns. That will push back enacting the law for at least a few months. The Town Board wanted to have the law in place to assist Kateland Farms, a miniature horse farm, with hosting weddings. The farm owned by Ted Jenney on Lake Road has been hosting weddings and special events in recent years. However, the property currently can’t host those events, according to regulations for a residential-agriculture zoned district by the town. Murray last year agreed to allow Kateland to host scheduled weddings for 2018, but the town didn’t give approval for weddings in 2019 until Murray has a legal mechanism in place. 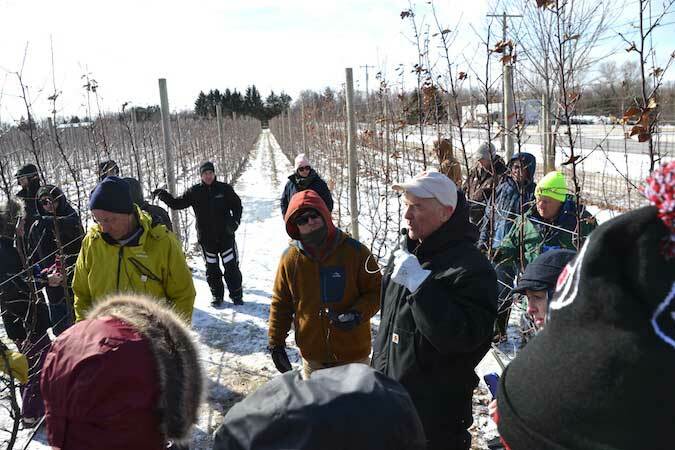 That was the impetus for the new local law, with the town also wanting to encourage events at other farms and wineries, as long as the farms secured a special use permit with the town. Farms and wineries can host events if they are in an agricultural district. The Ag and Markets Department says the events are permissible as long as they don’t account for more than 30 percent of the farm’s revenue. Ag and Markets advised the town that Kateland Farms wasn’t covered under Ag & Markets for its events because weddings weren’t a direct tie to a farming operation, town attorney Jeff Martin said during Tuesday’s Town Board meeting. The town wanted to help Kateland Farms continue to host weddings and special events. The proposed local law was geared towards farms and wineries that aren’t in agricultural districts. 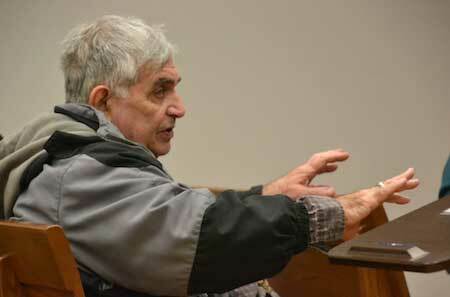 David Piedmonte, a Holley garlic grower, said the proposed law might prove a hindrance to farms, rather than a help. However, the Town Board was told by some farmers who do special events now that the proposal was vague in some parts, making the farmers nervous how the law would be interpreted by the Town Planning Board and code enforcement officer. Amy Machamer, co-owner of Hurd Orchards, said the farm relies on events to see fruit, flowers and other farm products. Hurd has been doing events for at least 40 years. The farm wouldn’t be affected by the town’s proposed law, attorney Martin said, because it is covered by Ag & Markets. Machamer, however, said she remains concerned the law could be interpreted differently by town officials in the future, potentially impacting Hurd’s events. For example, the town proposed law requires 100-foot setbacks from the road for buildings. Hurd has many historic buildings that are close to the road. The proposed law also has regulations for noise, bathrooms and other proposals to help mitigate the impact to neighbors. Joe Sidonio, Machamer’s husband, believes Kateland Farms is already covered in the town’s Right to Farm legislation. Sidonio said the proposed law is “overregulation” with unintended consequences. Town officials said the law doesn’t include farms and barns that host graduation parties and family reunions – events where no profit is made. Hendel said the town will continue to work on what he said it a “hard issue.” The town wants to help more farms to be able to sell products and host events that can help the farms supplement their income. 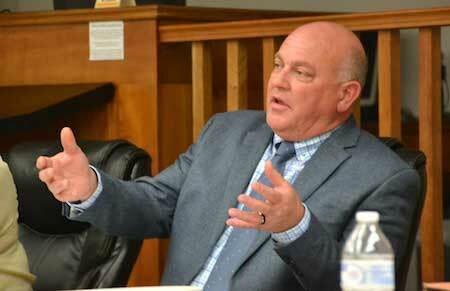 “I think this has the potential to be a win-win for everybody,” Hendel said. Today, Senator Rob Ortt (R,C,I,Ref-North Tonawanda) and his Senate Republican colleagues raised concerns over the release of hearings surrounding the proposed Farmworker Fair Labor Practices Act. In a letter to the respective Chairs of the Senate Agriculture Committee and Senate Labor Committee, they questioned the limited scope of only holding three hearings, which are set to take place in Nassau, Sullivan, and Madison counties. The Capital Region, Hudson Valley, North Country, Southern Tier, and Western New York – along with farm industries specific to those regions – will be without input into the sweeping legislation. Joining Sen. Ortt in signing the letter were Senators Pamela A. Helming, Robert E. Antonacci, Rich Funke, George A. Amedore Jr., Chris Jacobs, Sue Serino, James N. Tedisco, Daphne Jordan, Betty Little, Thomas F. O’Mara and Fred Akshar. Last month, Sen. Ortt and his Senate colleagues authored a letter to the Agriculture and Labor chairs requesting that community hearings be held across the entire state. In a study conducted by Farm Credit East, it is estimated that the Farmworkers Fair Labor Practices Act would add at least $299 million of costs on the backs of New York’s farming community, which would reduce net farm income by a staggering 23 percent. 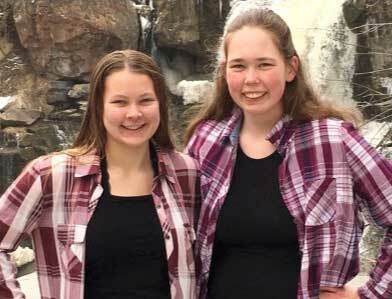 Provided photo: Sadie Klumpp, left, of Newfane will be the alternate Niagara-Orleans dairy princess this year while Hayley Roehling serves as the dairy princess. 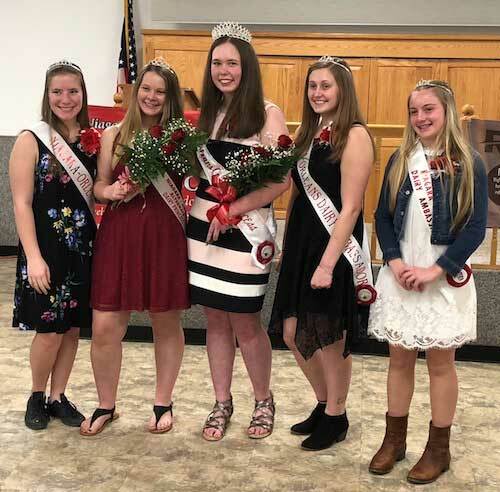 HARTLAND – New royalty will be crowned on April 6 during the annual Niagara-Orleans County Dairy Princess Pageant. The reigning princess, Gwenna Goodenough, will reflect on her accomplishments over the past year before she passes her torch to the next princess, Hayley Roehling, of Akron. The alternate this year will be Sadie Klumpp of Newfane. Dairy princesses from across the North East region visit schools, appear at community events and attend civic meetings to talk about milk and dairy products and the dairy industry. Both Hayley and Sadie are seniors this year and exhibit dairy cattle in the Niagara County 4-H program. They are eager to share their knowledge of the program as well as work on new ways to promote the dairy industry. The Dairy Princess Pageant will be at 7 p.m. on April 6 at the Hartland Fire Hall. 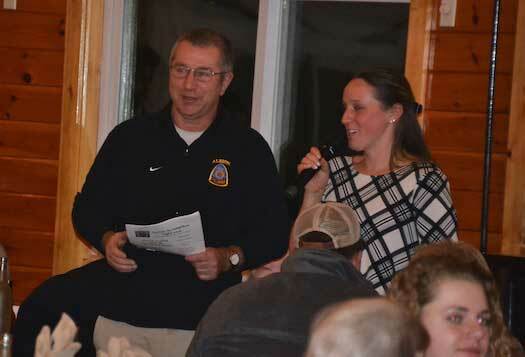 LYNDONVILLE – The 21st annual Orleans County Farmer to Neighbor Night was Saturday at the White Birch Golf Course and brought together about 150 members of the farming community. The Albion FFA is one of the organizers of the event. 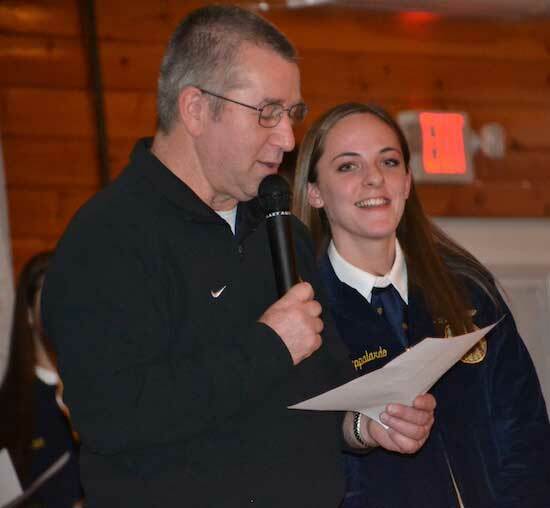 The top photo shows emcee Barry Flansburg, president of the Albion FFA Alumni, and Abbie Pappalardo, a current member of the FFA. She said she enjoys making friends through the FFA. Adam Krenning, the Albion FFA advisor and agriculture teacher, thanks the crowd for supporting the FFA program. He said many local farms and organizations back the FFA throughout the year. 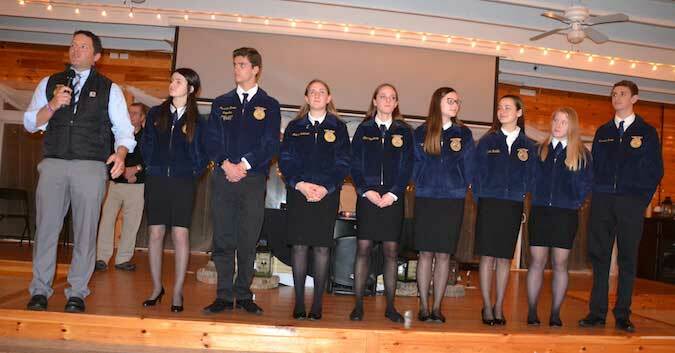 He is joined by, from left: FFA President Bailey Nesbitt, Harrison Brown, Melissa Robinson, Abbie Pappalardo, Bryne Dysard, Faith Woody, Kendall Derisley and Jeffrey Brown. The Farmer to Neighbor Night celebrates the county’s leading industry. Agriculture generates more than $100 million in sales to the farms, and that doesn’t count the spinoff economic impact with tractor dealerships, veterinarians and other businesses. 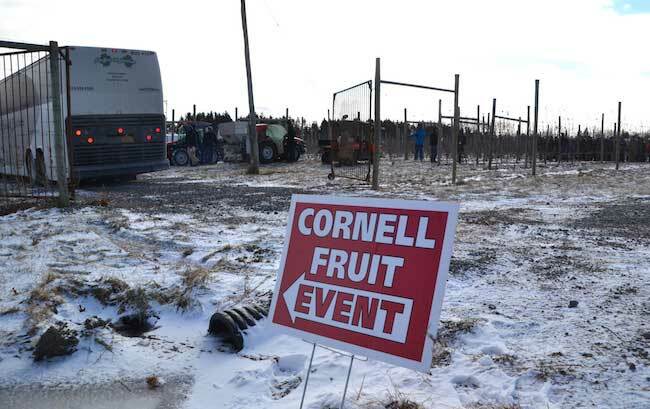 The event is sponsored by Orleans County Cornell Cooperative Extension, Farm Bureau, Soil & Water Conservation District, Chamber of Commerce and Albion FFA Alumni. Harrison Brown, an FFA member, delivers one of the items that was up for bid. It was purchased by Tim Winters, CEO of Western New York Energy in Medina. 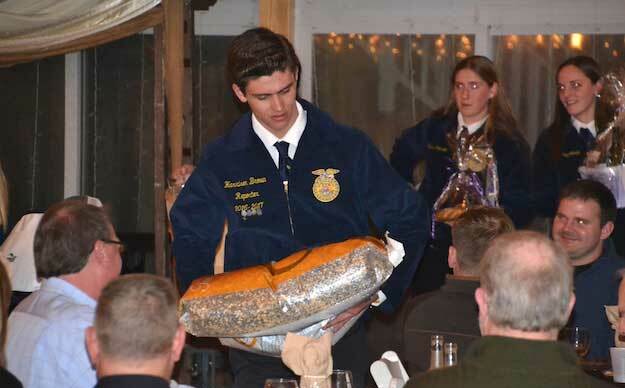 An auction raised money to support the FFA program. Melissa Robinson is introduced to the crowd. She said she enjoys meeting people through FFA and pushing herself in many of the FFA competitions. 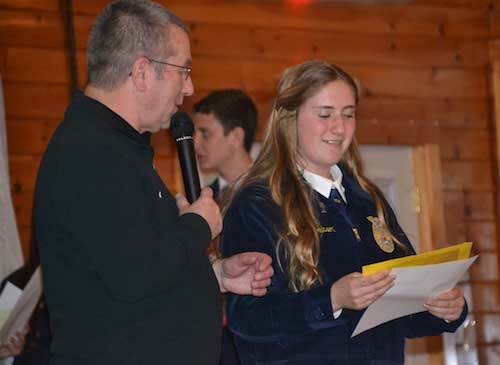 Barry Flansburg chats with Paige Levandowski, a former Albion FFA member who was vice president of the FFA in New York. Levandowski now works as a middle school teacher in Albion and helps with the FFA program at her alma mater. 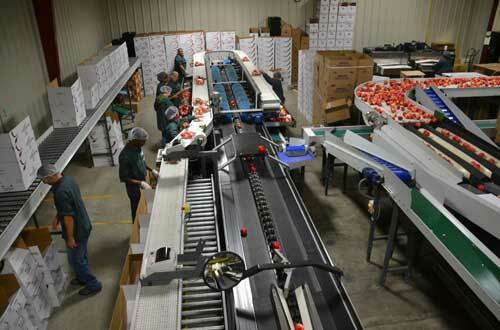 Photos by Tom Rivers: Workers at Lake Ontario Fruit in Albion fill bags and boxes with SweeTango apples in this photo from September 2014. New York Farm Bureau on Tuesday highlighted a new report that detailed the extreme costs facing the state’s family farms should the farmworker labor bill (S. 2837/A. 2750) pass this legislative session. The additional labor costs would also take a significant bite out of net farm income, especially at a time when the farm economy is suffering. 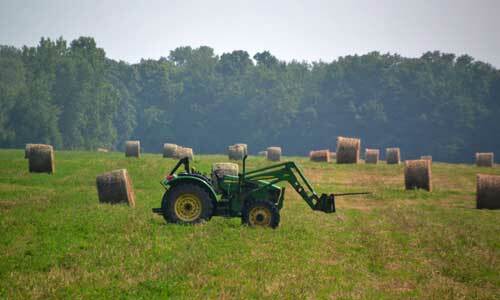 The report says, when combined with the rising minimum wage, net farm income will drop by 23 percent. Some of the state’s more labor-intensive commodities would take an even bigger hit financially. 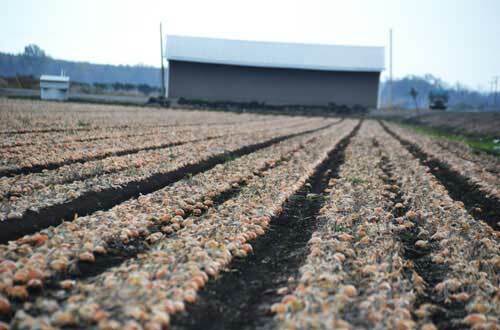 Vegetable growers will see net farm income decline by 43 percent. Greenhouse and nursery operations will have a 58 percent drop. 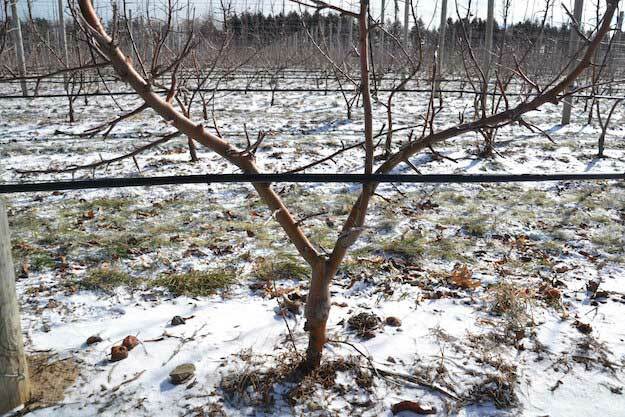 Fruit growers will take a 74 percent hit. And dairy farms, will see net farm income completely wiped out with a 101 percent drop. These numbers are based on a five-year average of financial results. During the press event, NYFB President David Fisher said the repercussions of this legislation based on economic analysis will be felt far beyond the state’s family farms and extend to the further decline of the rural economy both upstate and on Long Island. Already, according to the USDA, New York has lost nearly 20 percent of its dairy farms in the past five years. Undoubtedly, this legislation would make that dire situation worse. Fewer farms means fewer jobs on the farm and off as farm spending supports other rural businesses in their local areas. The Elba Muck stretches into Barre and Clarendon in Orleans County, as well as Elba and Byron in Genesee County. Onions, potatoes and other crops are grown on the muck, shown in October 2015. Brian Reeves, of Reeves Farms in Baldwinsville, has a 350-acre vegetable farm growing both conventional and organic crops. With labor costs already making up 40 percent of his expenses, overtime after 40 hours per week would cost his farm an additional $133,137 in wages per year, or approximately a 15 percent increase, based on 2018 numbers. This does not include the additional cost for taxes and workers compensation which would also increase with the higher wages. ALBANY – Albion students in the FFA have spent the past two days in Albany meeting with state legislators and agriculture officials. 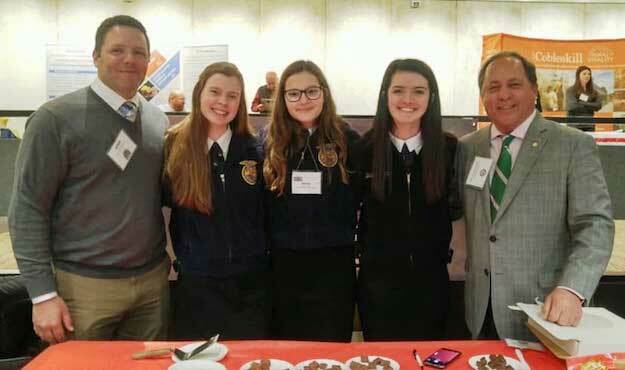 The photo shows, from left, FFA Advisor Adam Krenning, Lauren Beam, Bryne Dysard, Albion chapter president Bailey Nesbitt and State Assemblyman Steve Hawley. They meet at the Taste of New York reception on Monday, sponsored by the New York Farm Bureau. This event highlights agricultural products produced in New York State. The reception was held at the Empire State Plaza Convention Hall. Students also met with State Sen. Robert Ortt and Richard Ball, commissioner of the NYS Department of Agriculture and Markets.